a conceptual framework and micro-credentialing system based on NWP social practices and leadership competencies. Our focus in this post is to introduce you to the Write/Learn/Lead Knowledge Base and explain a bit about how we developed it, what’s in it, and how you might use it. If you’re reading this, you’ve already landed on Write/Learn/Lead, the NWP’s new website, which contains a lively blog as well as the Knowledge Base, a collection of resources curated from several websites that are part of NWP’s online universe. Over a span of two years, we worked with a team of six NWP site directors to curate the current collection of over 450 resources. 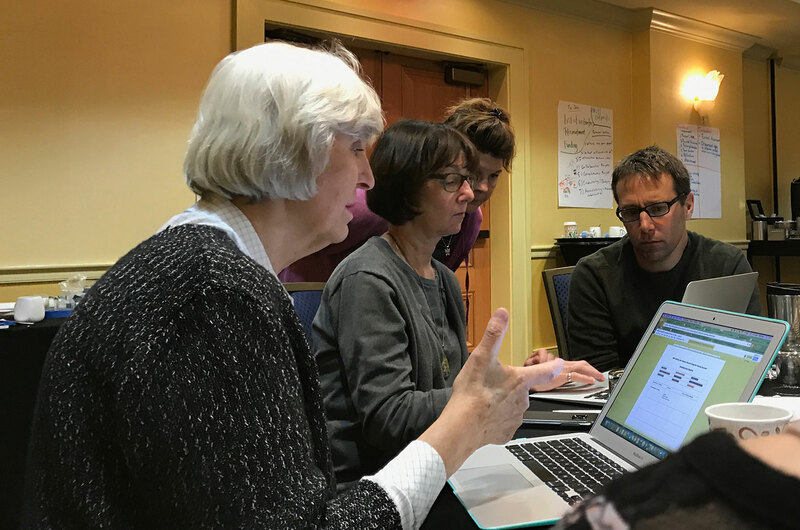 In the process, we felt an enormous responsibility to the intellectual legacy of NWP as we reviewed resources from archives representing over forty years of high-quality work from NWP-affiliated educators and Writing Project sites across the country. We created the Knowledge Base with two initial audiences in mind: new teacher leaders who need resources to support their work with other teachers, and site directors and experienced teacher leaders looking for resources to support their guidance of new teacher leaders. We believe that the Knowledge Base will be useful for a range of Writing Project work. Nonetheless, we particularly wanted to address the needs of potential teacher leaders who will enter Writing Project sites via new pathways beyond a traditional summer institute. These might be teachers in a hybrid summer institute, for example, or in a year-long program focused on a specific content area, or in a program for community-based educators. Our goals have been to identify foundational resources with the elasticity to introduce Writing Project principles to an increasingly diverse population of teachers as well as to gather content that is specific enough to speak to emerging teacher leaders from such a range of experiences. The resources vary: you’ll see one-page protocols and 40-page booklets, sample recruitment flyers and research studies; multimodal projects and “vintage” articles from the early days of NWP. Our aim has been to reflect at least a couple of realities for Writing Project teacher leaders: the urgency of finding adaptable models, such as prompts or strategies for an upcoming workshop, and the need for texts that support rich conversations and provide theoretical/scholarly foundations for our work. The summaries that introduce individual resources were written to reflect these different audiences and needs. Resources in the Knowledge Base are organized and can be accessed in multiple ways: by tags; by using the search bar; or by any of its nine content categories. Knowledge Base categories reflect aspects of Writing Project teacher leadership: e.g. teacher inquiry, leading professional learning, teacher as writer, as well as our mission as a Writing Project community regarding specific populations of learners and ways to address social justice issues within the context of teaching and professional development. Categories can be viewed from the drop-down menu or from the tiles on the Write/Learn/Lead homepage. Some resources live in more than one category: a piece on revision and writing groups in a first-grade classroom, for example, appears in “About Writing” (because it addresses revision) as well as in “Teacher Inquiry” (because it is a published piece of teacher research and a good model to show new teacher researchers). You’ll notice at the bottom of each individual resource links for sharing (Email, Facebook, Twitter) or adding it to a collection that you might organize to support your work (Pinterest, Pocket). The site highlights the 45 tags that have been used most often, but there are about 100 in all. You can click on one of those tags at the bottom of the Knowledge Base homepage or to the right of a specific resource. In addition, each resource includes, under the title, the categories and tags associated with that resource. Clicking on one of those tags will take you to all the resources associated with that tag. You’ll also find a search bar at the top of homepage of Write/Learn/Lead and on each category and individual resource page within the Knowledge Base. So come on in! Explore the Knowledge Base and use the site whenever and however you imagine it will support your work. Some of the resources have already been pushed out (and will continue to be) on NWP’s social media, and there will be ways in the future for you to contribute resources from your own work to refresh and expand the collection and to assure that the Knowledge Base continues to be representative of work across the network. We want to wrap up by thanking the great team of NWP site leaders who have worked diligently, with intelligence and good humor, on this project over the past two years. They are Mark Dziedzic (Greater Madison Writing Project), Dixie Keyes (Arkansas Delta Writing Project), Marilyn McKinney (Southern Nevada Writing Project), Tom Meyer (Hudson Valley Writing Project) Tonya Perry (Red Mountain Writing Project), and Catherine Quick (Coastal Bend Writing Project). We also want to thank the amazing Luke Hokama and Tim McIntyre for their fine work on site design and navigation, and the teacher-consultants and site directors who previewed the site at various points and offered us invaluable feedback. I am happy to see new resources, but I have some questions: who is using this and how are they using it? You might need some ‘use cases’ so that new teachers can follow someone else’s path from start to finish until they are able to blaze their own teaching trails. Or likewise for site directors? Use cases. Maybe I have missed them? I am happy to stand corrected., but it this page is not entirely user friendly (at least this reader/user).